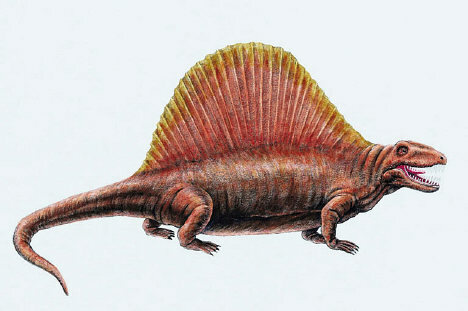 Dimetrodon is probably the best-known of the mammal-like reptiles. It was a predator that lived in the Permian period between about 280 million and 265 million years ago. Dimetrodon is believed to have been the largest predator in its habitat. Adults were up to 11 feet (3.5 meters) in length. It had four sprawling legs, and a large tail, and probably walked in a similar manner to lizards. It most noteable feature however is the large sail on its back. Dimetrodon's sail was filled with blood vessels and is believed to have mainly served to help in regulating body temperature. By facing the sail towards the sun, Dimetrodon could heat itself up quickly, and it could also use the sail to cool itself if it became too hot. Additionally, the sail may have served a number of secondary purposes such as attracting mates, or helping to deter other predators (by making the animal appear larger than it was). The name Dimetrodon means "two measures of teeth", and was chosen in 1878 by Edward D. Cope. This name reflects the fact that the animal's skull contains two different types of teeth (unlike reptiles which normally only contain a single type of teeth) - namely sharp canine teeth, and shearing teeth. Fossils of Dimetrodon have so been found in North America and Europe. As well as fossils of the animal itself, fossilized Dimetrodon footprints have also been found. Dimetrodon - Permian Predator Table of Contents Introduction Chapter 1: Appearance and Behavior Chapter 2: Environment Conclusion Bonus Dinosaur Content Introduction to Dinosaurs Facts about Dinosaurs Dinosaur Extinction Dinosaur Fossils Dinosaur Eggs Dinosaur Names Dinosaur Diet Feathered Dinosaurs Plant Eating Dinosaurs The Weirdest Dinosaurs The Deadliest Dinosaurs Flying Dinosaurs Kinds of Dinosaurs The Biggest Dinosaurs The Smallest Dinosaurs Author Bio Publisher Introduction Salutations young reader! Today we are going to embark on a journey back to an age that began before the dinosaurs walked the earth. The age I am referring to was an incredible age with incredible creatures. These ancient animals lived nearly 300 million years ago and thrived for about 50 million years. We humans have only been around for about 60,000 years and we have only been using computers for about 75 years. The ancient animals of this age mysteriously became extinct and disappeared from our earth, but left their fossilized remains behind. Fossils have been discovered constantly in human history; the Chinese thought they were dragon bones and Europeans thought they were the bones of biblical monsters. Luckily, the scientific study of ancient animals began in between 1815-1824 with the discovery of an Iguanodon fossil. Since then ancient animals and dinosaurs have been discovered all over the world. Their immense size, strange shapes, and wonderful natures make them inherently worthy of interest. The study of ancient animals requires depth of imagination, analytical skills, and thought. The many unanswered questions about their lives, behavior, and disappearance provoke the curious to seek answers and ask even more questions. I hope this book fuels your imagination and makes you want to learn even more about dinosaurs and the ancient animals which preceded them. I hope you learn to appreciate the value of your study and that you bring a spirit of openness and wonder on your journey back to an ancient age that began before the age of the dinosaurs. By Nathanial E J Hogan Age 8, "DINOSAURS!!! Kid's Book About the Dimetrodon from the Early Permian Period - Awesome Facts & Pictures for Kids about Dinosaurs" is an awesome non-fiction ebook with colourful pictures that look great on Kindles, Ipads, mobiles and many other tablet-style hand-held devices. The facts are presented in easy to read 'bite-sized' sections accompanied by a picture to help children not only learn about Dimetrodons, but to also enjoy reading about these famous sail-backed pre-dinosaurs. A perfect way for kids of all ages to learn. "...Dimetrodon.." is also great for parents to read to children who are not yet ready to read for themselves. This gives parents a great opportunity to discuss their children's favourite subject with them and to explain things further. Dinosaurs have always stimulated the imagination of kids and what better way to start your kids' interest in dinosaurs than with this easy to read guide with dinosaur pictures. They'll be roaring with delight! Join Dennis and all his dinosaur friends in their adventures in the park. When Dennis learns how to play with a skipping rope he gets much more than he bargained for and even makes a new friend in a very unusual place. . . The awesome cover is of a Dimetrodon dinosaur which lived in Texas about 200 million years ago. The back cover has more information about the dinosaur. This composition book is 200 pages of wide rule lined paper. It can be used by students of elementary and middle schools, homeschooling, teachers and school offices. It is perfect to write and keep notes. Teachers can use it to do lesson plans. The Dimetrodon dinosaur on the cover lived about 200 million years ago in Texas which was a marshy land at that time. On the back cover it tells more about this dinosaur. This composition book can be used by students in elementary and middle schools, homeschooling students, teachers and school offices. It is 200 pages with rule lined paper. …and this time there’s more than one. Henry Shore has been Chief Park Ranger at Crater Lake National Park for thirteen years now and thought the days when he’d had to fight a rogue dinosaur that lived in the caves below the lake were long over. Until one of his park rangers, to save a visitor’s life, is in a deadly struggle out in the woods with a new breed of dinosaur worse than the last one. It’s as big as a man, but this one is a young one. And growing. Then more of the creatures begin to show up everywhere, threatening people and destroying the tranquility and safety of his beloved park. A tourist trolley filled with fifteen people is snatched up off the crater’s rim by another version of the younger one…but this one has grown into a giant with fangs, claws and a deadly tail. And this one has wings. Ugly Gargoyles, Henry calls them. For this one isn’t alone. They’re flying beyond the park’s boundaries into the neighboring towns. The sultan faced a dilemma. He dared not fall in love again, yet he hated to be alone. His solution: take a new bride each night—and execute her at dawn! Into the fray runs Shahrazad, heroine of 'The Arabian Nights.' Her gift for spinning tales faces the ultimate test as she must enchant the sultan to save lives, including her own. This retelling of the classic tale, adapted as '1001 Nights: The Radio Play' for broadcast on ICRT, brings Shahrazad's legend to modern readers. Along the way it illuminates the dazzling orchestral showpiece by Nikolai Rimsky-Korsakov that the tale inspired. Ideally suited to oral storytelling, this new expanded edition offers the story in both its original version and in a dialogue version for four readers. Also included in this volume: ‘Five Vignettes’, a series of scenes that trace a journey from Florida’s Space Coast in the heyday of Apollo to the Taiwan Sunflower rallies of 2014, and two poems, 'Juilliardy' and 'A Beachside Psalm.' New for the third edition is a bonus preview of 'The Blacksnake,' a novella by A T Beaune.